During the summer transfer window, Chelsea strengthened a number of positions, however, surprisingly, center forward was not among those positions despite Alvaro Morata and Olivier Giroud’s struggles in the previous season. So far till January, the Blues have been struggling to put the ball in the back of the net and therefore are seeking for a solution. Chelsea acquired Gonzalo Higuain in an 18-month loan deal with an option to buy from Juventus to solve their goal scoring issue. However, is the 31-year-old Argentine the solution to Chelsea’s problems in the final third? To answer this question, we have to examine several factors. The official statistics suggest that Chelsea are in the second place in creating big chances. Therefore, we can discard the opinion that Sarri’s approach is the real cause of the problem. Nevertheless, if we take a look at Chelsea’s conversion rate and statistics of their attacking options, we can find our answer. As we can see from the stats, the reason why Chelsea find it hard to convert created chances to goals is due to the lack of end products from their attacking options, especially their center forwards. To start, there are a number of negative consequences of this problem. First, at the time of writing this article, although Chelsea are 4th in the Premier League table based on points gathered, and 2nd in the big chances created department, Chelsea have scored the least amount of goals among the top 6 clubs with just 40 goals scored after 22 league games. Secondly, due to the lack of lethality upfront, the Blues have a hard time penetrating the defences of the teams who play a low block against them. This, in turn, has lead to the Stamford Bridge outfit dropping points against teams that they dominated in games. Examples of such cases include Chelsea’s draws with West Ham, Southampton, Everton, and their loss against Leicester at home, the game in which Chelsea hit the upright and the crossbar but could not find a single goal. 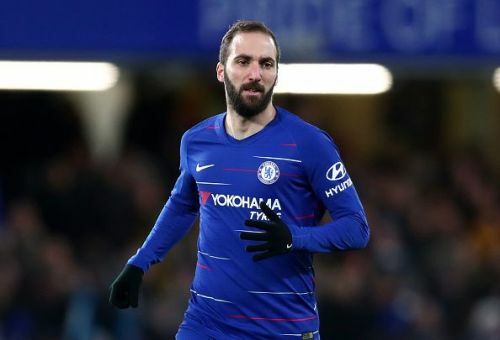 So is El Pipita the answer to Chelsea’s problem? Higuain did have a poor outing with AC Milan but he had much lesser quality around him in his teammates at Milan compared to who he will be playing with at Chelsea. Moreover, Higuain is already familiar with Maurizio Sarri’s Sarriball as the Argentine played under the Italian coach in 2015/16 season and scored 38 goals in 42 matches. Therefore, settling in the team and getting used to the tactics of the coach should not take a long time for the Argentine forward. The Argentine goal machine has proved numerous times that he possesses a solid mentality and manages to perform and score goals in a consistent manner when he plays for the right team. However, although Gonzalo is Chelsea’s best option in the short-term, in the long run, the club will have to find a new striker. As mentioned above, the Argentine still has capabilities to play for a top side, nonetheless, he is 31 and will be declining soon.